I was sleeping. My wife woke me up and told me the downpour was really bad and kindly suggested (her version, my version was more of an order) that I adjust the drain hose on the downspout. Bear with me while I take a brief tangent to explain some background. Our house is not very large nor expensive (I’m sure those are related) so my wife swaps the seasonal coats around in the limited 1st floor closet space. Second notable item, we are experiencing a delayed winter. Before I could dash outside I had to wake up and get my rain jacket from its basement storage area (also I’m not a morning person). As I lumbered down to the basement I saw the message Mother Nature left (so nice to leave messages). Mother Nature called to tell me our sump pump was dead. She displayed the message all across the basement floor. When water starts flowing across a basement floor you notice all types of cardboard boxes that you didn’t realize were there. The morning was spent moving, clearing, dumping, wet vacuuming, and squeegee pushing. By mid afternoon I had extracted the dead pump. Our problems were minor compared to others in our village and surrounding area. If you lived near a small stream, you discovered the now river strength water was asking to take you house along with it. A section of major highway through our village was completely under water (see pic below). A parking lot at a nearby grocery store had become a good size lake with cars forming islands. According to regional weather forecasters more rain has fallen in this month of April (still more that a week left) than during ALL of last summer. 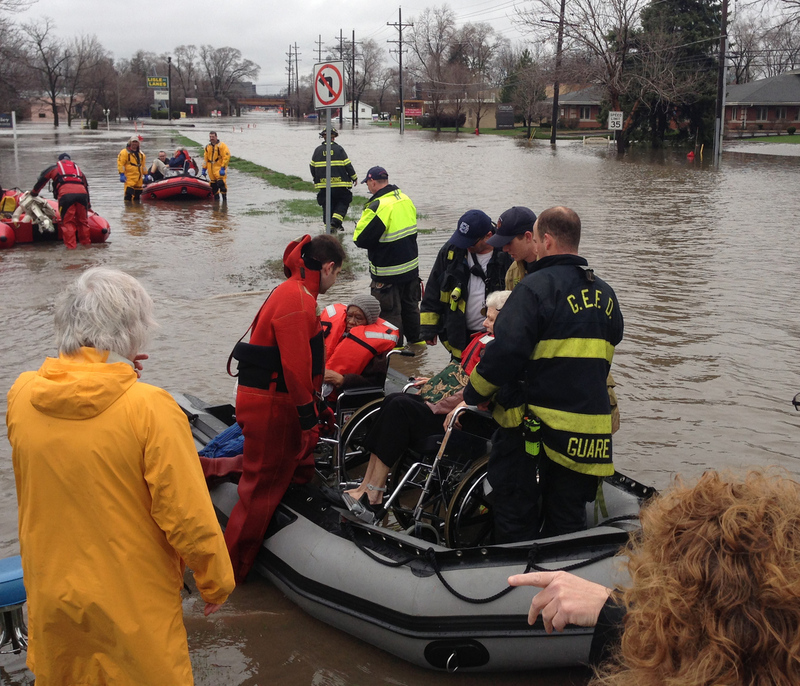 Our village of Lisle made the top of one list of rainfall measurements on the local news. It was over 6 inches. Lisle was also mentioned by Brian Williams on the NBC national news. 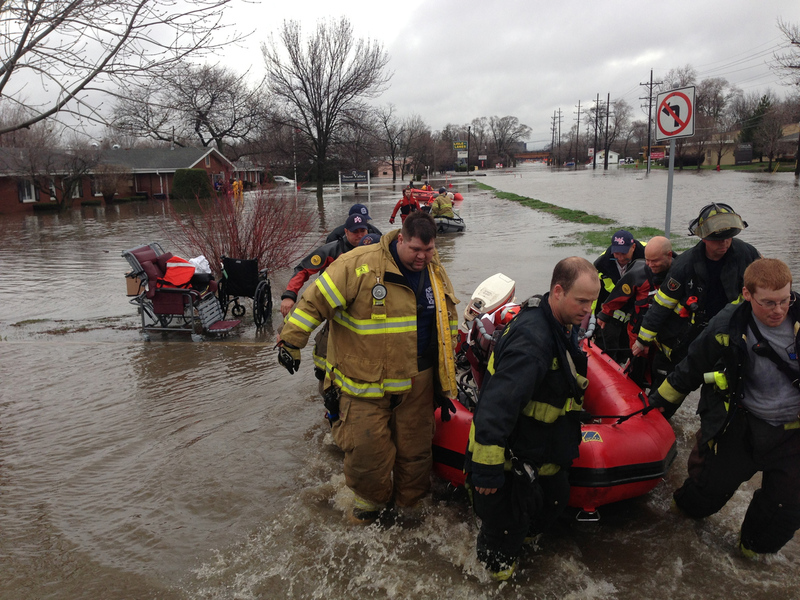 Photos from Chicago Weather Center Blog and Huffington Post. You can find more photos by following the links back to those sites. Every Sunday since my blog started getting visited by Unknown Mami there has been a photo sharing/linking post at her blog. Check it out. Yikes that stinks! Our sump pump has been working over time and not sounding too happy I hope it last awhile longer! I hope you dry out soon! 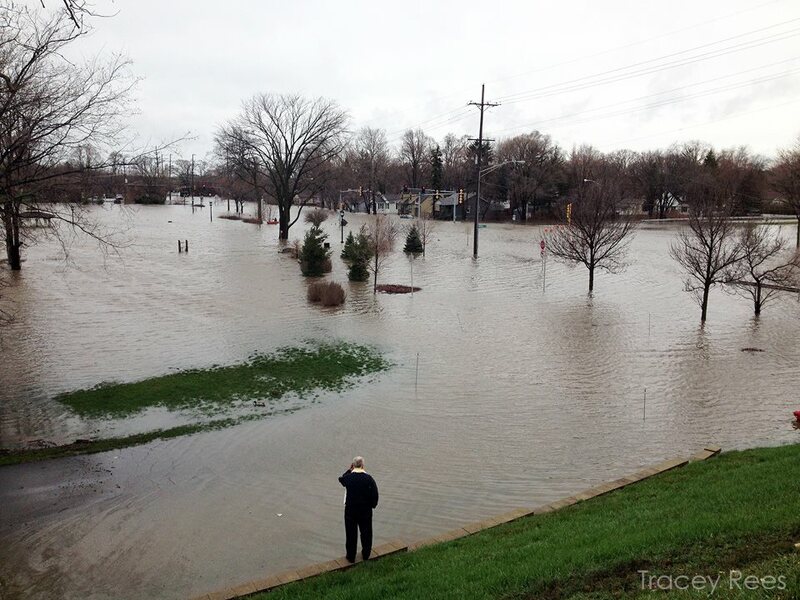 I was listening intently about Lisle's flooding, That is awful to have that much water running through your town. I sympathize with the sump pump fail. I had that happen a couple of years ago. My basement is finished and it proved to be an expensive fix. Hope all goes back to normal ASAP. what a mess! hope the rain slows or stops SOON! I grew up in a house with a sump pump. Dang. I am so sorry it bit the dust. And the flooding. Ugh. We have no sump pump and a leaky basement. We had all kinds of streams seeping through the wall/floor along a couple of the walls in our basement. A rug is toast. It's in the garbage. That was our only casualty. Thank goodness our basement isn't finished. Just concrete next to concrete. thanks, The carpet had been ripped up from a sewer problem a few years back. Biggest problem is getting it dried out good. If I had been super pro-active and a bit of fortune teller, I would have replace the old thing before the big rain forecast. We are doing fine thanks. Thanks, it's getting close to normal (whatever normal is?). Finished basements are risky. Did your home insurance cover it. I heard some policies do not cover anything below ground level. We didn't have any major damage. Just lots of cleaning and trying to dry out. Yes, we have insurance to cover the lower level. Not much damage was done when our sump pump failed either. One room of carpet had to be replaced. For 20 years I lived in a house with a sump pump. Double whammy; we were 2 miles from Lake Erie. If we dug a hole it filled with water in ten minutes. In that time we had two storms of the century that overpowered the city story sewers. Not fun. The job ahead is taxing. 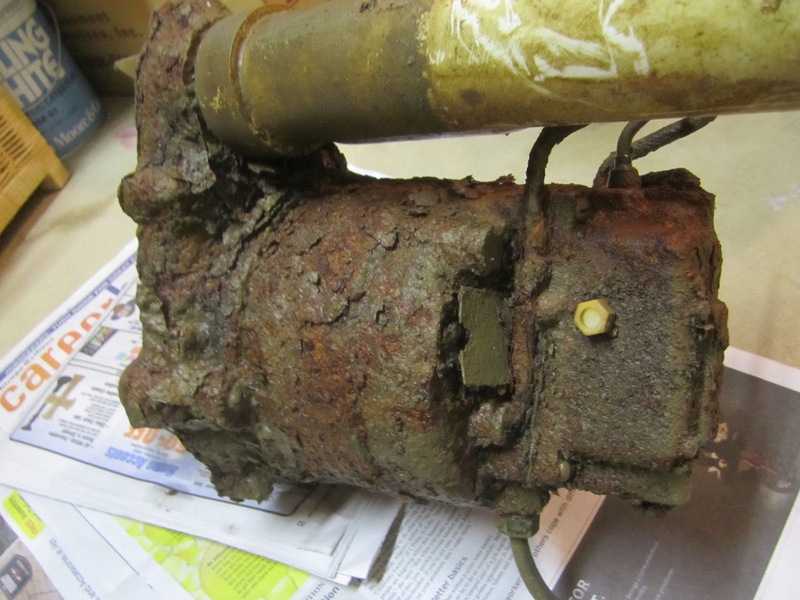 You might consider a sump pump with a marine battery back up for power failure. I'm so sorry to hear you were affected by the storms. We live in the Albany Park neighborhood and parts of it were submerged and on the news, too. We were lucky. Not a cool SIMC post, in the fact that you have had some stress and damage. Floods are very damaging. I hope your house and town return to normal soon. thanks - yes there has been numerous moments of stress. I was lucky to find a decent sump pump. The stores in the area were selling out. I drove miles to find one. Yes the power failure is extra protection but that option was not an option since I got one of two left on the shelf. I guess you need to live on hill if you live near a big lake. 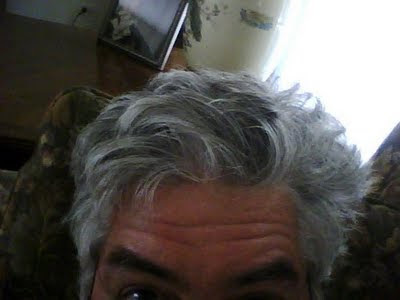 My wife would be able to give you a view of me that would be different than my blog does. It's great to hear you got a laugh. Many events that are not funny while they are happening can be funny to look back on. Thanks for browsing by and spending a bit of time here. The text color could vary depending on the computer. On mine it looks white after it's posted and black-on-white while I'm typing it. I should find out if I can make it larger. thanks - It was much much worse in the part of town near the river. We are uphill from that area. Things are much better now. OH yeah I drew that on there in case you came by. I didn't even notice that. I assume you are pointing out the white mark where the scum was rubbed away. Interesting, do you think Nyan cat would be worth more than seeing an image of the Virgin Mary or Jesus? I'm sorry about your pump, but I'm glad you guys are okay.